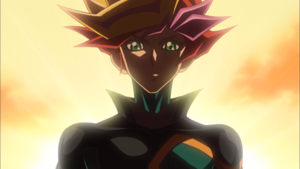 "Playmaker's Breath" is the sixty-fifth episode of the Yu-Gi-Oh! VRAINS anime. It first aired in Japan on August 22, 2018. The Ancient Ghost has "Link Spider" (1000/↓) in its right Extra Monster Zone, "Doublebyte Dragon" (1500/↑↓) in its left Extra Monster Zone, two copies of "Tri-Gate Wizard" (2200/←↑→) in the zone the bottom Link Arrows of "Link Spider" and "Doublebyte Dragon" point to, and "Honeybot" (1900/←→) in between both copies of "Tri-Gate Wizard". It also has a Set card ("Chaos Burst"), and 4000 LP. The Knight has "Update Jammer" (2000/←↑) in the zone the top Link Arrow of "Doublebyte Dragon" points to, and "Sea Archiver" (300/2100) in the zone to the right of "Update Jammer". He also has three cards in hand ("Tremendous Fire", "Thunder Crash", and "Megamorph"), "Cyberse Gadget" in his deck, two Set cards ("Link Restart" and "Torrential Reborn"), "Dotscaper" in his GY, three monsters in his Extra Deck ("Secure Gardna", "Binary Sorceress", and "Proxy Dragon"), and 100 LP. The Knight must win in one turn. The Knight draws "Cyberse Gadget". The Knight activates the Equip Spell Card "Megamorph", equipping it to "Update Jammer". As the Knight's LP is lower than the Ancient Ghost, the effect of "Megamorph" makes the ATK of "Update Jammer" become double its original ATK ("Update Jammer": 2000 → 4000 ATK). "Update Jammer" attacks "Link Spider". As the Knight's monster declared an attack, the Ancient Ghost activates its face-down Trap Card "Chaos Burst", Tributing a monster to destroy the attacking monster, then inflict 1000 damage to the Knight. It Tributes "Link Spider" to destroy "Update Jammer" (The Knight: 100 → 0 LP). After the Knight failed the puzzle, Unknown took his attempt. Unknown draws "Cyberse Gadget" and subsequently Normal Summons it (1400/300). As "Cyberse Gadget" was Normal Summoned, Unknown activates its effect, Special Summoning a Level 2 or lower monster from his GY. He Special Summons the Level 1 "Dotscaper" (0/2100). Unknown uses "Cyberse Gadget" and "Dotscaper" to Link Summon "Binary Sorceress" (1600/←→) to the zone the middle-left Link Arrow of "Update Jammer" points to. As "Cyberse Gadget" was sent from the field to the GY, Unknown activates its effect, Special Summoning a "Gadget Token" (0/0). As "Dotscaper" was sent to the GY, Unknown activates its effect, Special Summoning it (0/2100). Unknown uses the "Gadget Token" and "Dotscaper" to Link Summon "Proxy Dragon" (1400/←→) to the zone the middle-left Link Arrow of "Binary Sorceress" points to. Unknown uses "Binary Sorceress" to Link Summon "Secure Gardna" (1000/→) to the zone the middle-left Link Arrow of "Proxy Dragon" points to. Unknown activates the Spell Card "Tremendous Fire", inflicting 1000 damage to the Ancient Ghost, and 500 damage to himself. As a Spell/Trap Card or monster effect was activated that would inflict damage to Unknown was activated, he activates his face-down Counter Trap Card "Link Restart", negating the activation, then Special Summoning a Link Monster from his GY. He negates the activation of "Tremendous Fire" and Special Summons "Binary Sorceress" (1600/←→). Unknown activates the Spell Card "Thunder Crash", destroying all monsters he controls, and inflicting 300 damage to the Ancient Ghost for each monster destroyed. He destroys his five monsters and inflicts 1500 damage (Ancient Ghost: 4000 → 2500 LP). As the WATER "Sea Archiver" Unknown controls was destroyed by battle or card effect and sent to the GY, Unknown activates his face-down Trap Card "Torrential Reborn", Special Summoning the monsters destroyed and sent from the field to the GY at that time, then inflicting 500 damage to the Ancient Ghost for each monster Special Summoned this way. He Special Summons "Sea Archiver" (300/2100), "Update Jammer" (2000/←↑), "Binary Sorceress" (1600/←→), "Proxy Dragon" (1400/←→), and "Secure Gardna" (1000/→), and inflicts 2500 damage to the Ancient Ghost (Ancient Ghost: 2500 → 0 LP).